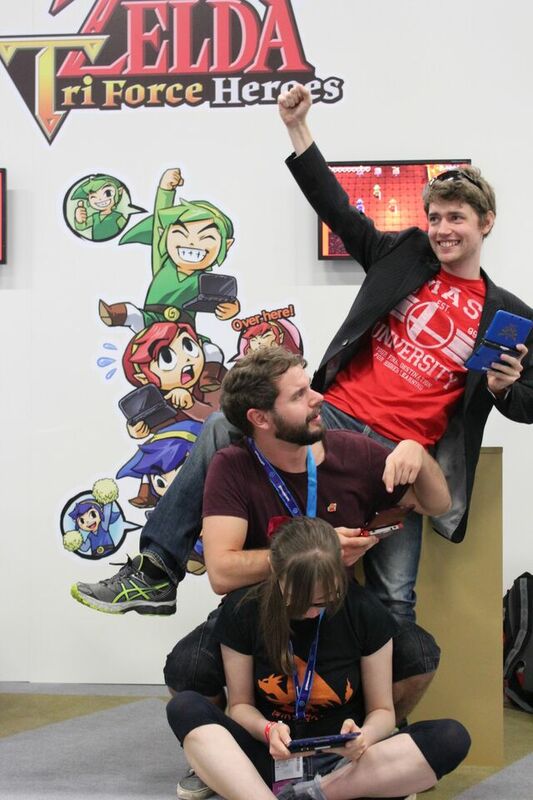 I had a great time at Gamescom 2015, and you can read all about the event in figures here. 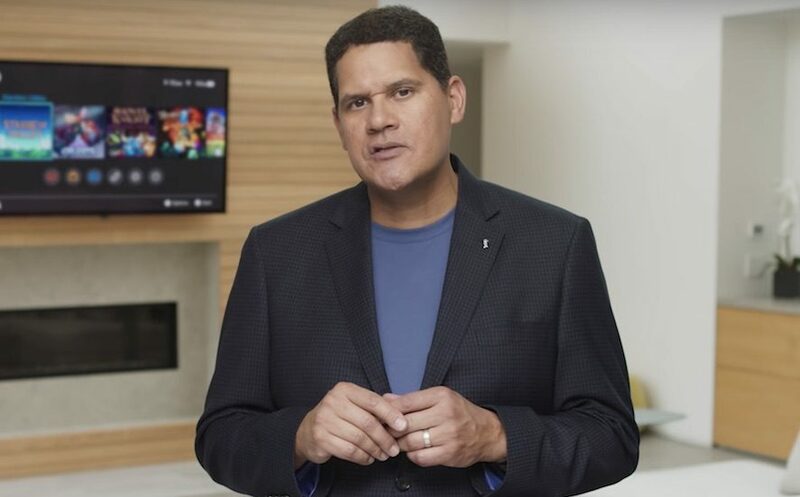 Next, I want to talk to you about Nintendo’s booth! As usual, you could find Nintendo’s booth in hall 9.1. The stages and gaming stations had a lovely design to them, from blocks and coins that hung from the ceiling to a Zelda-themed carpet that featured the Triforce. But see for yourself: Nintendo uploaded a video on how they built their booth. Their line-up was pretty similiar to the E3 one. 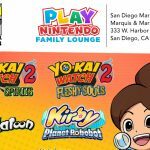 For the 3DS you could find Tri Force Heroes and Chibi Robo: Zip Lash in Nintendo’s booth. Also playable were Starfox Zero, Mario Tennis: Ultra Smash, Super Mario Maker and Skylanders SuperChargers for Wii U. The big highlight was Xenoblade Chronicles X, which was playable for the first time at the Gamescom! 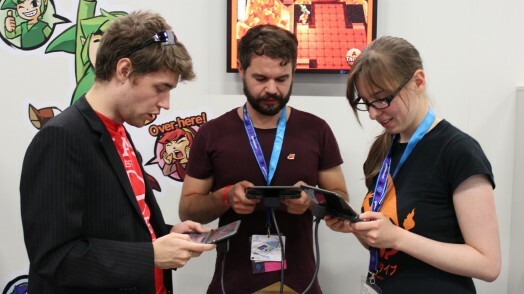 Fortunately we were a group of three people, so we could easily play Tri Force Heroes together. It was fun, but requires a lot of teamwork. While I played together with friends, it felt like we could easily (but not too easily!) get through the stages. We worked together well thanks to us yelling solutions at one another, and eventually we made it through. Some of us fell into the lava more often than others, but we made it! When I was teamed up with other people that I didn’t know (some of whom even spoke different languages) on the other hand, it was quite different. Of course we tried to work together, but with a limited vocabulary to communicate with, it was quite hard. The symbols at the bottom were barely used, simply because we were sitting/standing next to the person and direct communication just seemed to make more sense. I am not sure how well those signals will work in the online mode though. Sure they will help to communicate, but will they be enough? In summary, it was a lot of fun although tricky and the puzzles were way harder than I first expected them to be. I had my doubts that the game would work as a single-player experience, as the difficulty could be too easy. Now, however, I am sure it’ll translate very well into both a single-player game and (local) multiplayer game. While I still have my doubts about the online multiplayer, I am looking forward to test that out too! Participants had the chance to win either a Splatoon Amiibo set or Amiibos based on Mario Kart or Super Smash Bros. characters. New games are not everything Nintendo featured in their booth. Next to the information counter, where they also handed out the Pokemon codes, they had set up a Battle Corner. The focus lay on different games that have been released in the past and offer competitive play. Among which was Smash Bros., Mario Kart 8 and of course, last year’s most successful title, Splatoon. 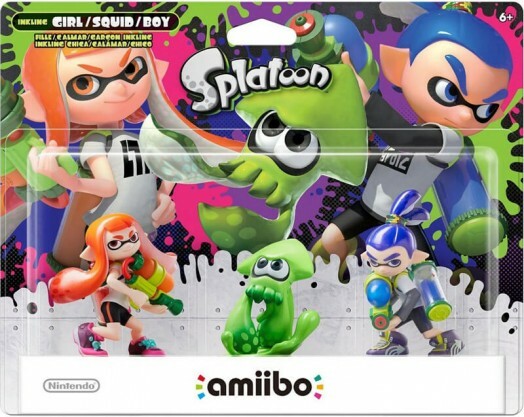 In those battles you could compete against one another for an Amiibo set depending on the game you played. Participants could fill in a form and put it into a box, and at the end of day one a winner would be drawn. You could win one set (for each game) every day. Sadly, my name wasn’t drawn. From Thursday on you had the opportunity to test the new weapons from Splatoon‘s latest update on the show floor next to Starfox Zero. A fully translated demo was available to play! We also had the chance to play Yokai Watch, a new series which is a huge success in Japan and seems to be a bit similiar to Pokemon. You play as a young boy who fights so-called Yokais, ghost-like monsters that are mostly based on Japanese lore and resemble mythical creatures. In the demo, you are supposed to track down three Yokais in a small suburb by talking to NPCs and using your Yokai Watch (an item your character wears) to find the evil spirits. The game was very detailed; every house had a complete layout and a unique design. A lot of details could be seen which was truly fascinating. It’s an RPG that has a turn-based fighting system that works a bit similiar to Pokemon‘s triple fighting system. You can carry up to six Yokai, three of which can fight at once. With the stylus, you choose which Yokai is supposed to attack. Depending on the Yokai you choose, you get a task to fullfil: tracing a symbol, popping bubbles, tapping the screen, etc. If you are successful, your attack will do more damage and be more powerful. The game looks promising, and I am truly looking forward to it! Nintendo won a total of three Gamescom awards, which made their already impressive line-up more appealing. Super Mario Maker won “Best Console Game Nintendo Wii” as well as “Best Social/Casual/Online Game” award, and Tri Force Heroes was victorious in the category “Mobile Games”. Another part of the Nintendo booth is the show stage. 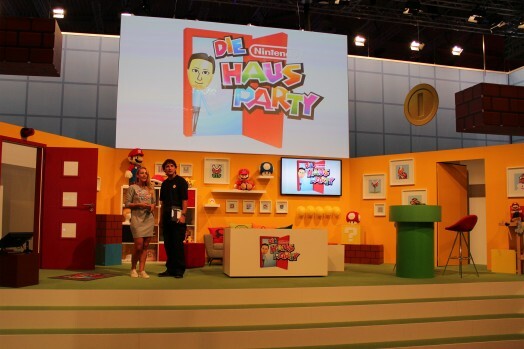 The stage, which was designed to be a big living room with Mario-themed decoration, held The House Party. Here they celebrated Mario’s 30th birthday twice a day. Most of the decoration had been sent to Nintendo in advance by fans. 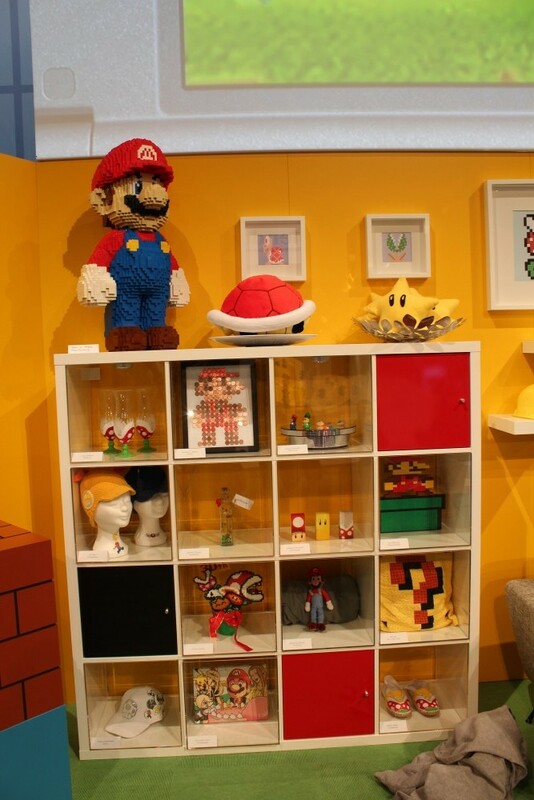 One of the many things to be featured was a Lego Mario, which was approximately 120cm and took 2 months to be built, as well as a Blue Mushroom which was half the size. Both figures were entirely built with Lego bricks. These fan-made Mario-themed goodies looked adorable! Mario himself showed up for the birthday party, and brought his voice actor, Charles Martinet, with him. During the House Party they gave away a dozen Amiibos and showed off Super Mario Maker. They also invited a few famous German Let’s Players, and held small competitions. 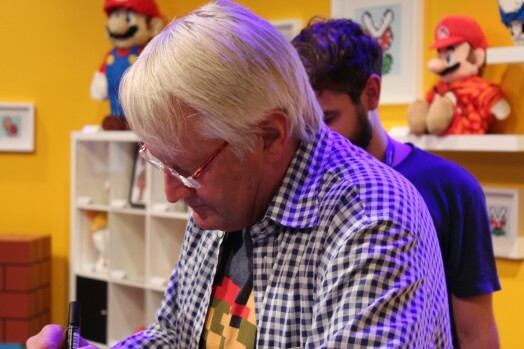 None other than Charles Martinet, the voice of Mario, was there too! Unlike the previous years, Nintendo also presented a lot of Nindie-titles. Typoman, Mighty No. 9 and FAST Racing Neo, Runbow, Rive, Beatbuddy, Soul Axiom, Year Walk, Poncho and Extreme Exorcism were playable for Wii U. They had also a 3DS games set-up which featured Shovel Knight: Plague of Shadows, as well as several other titles such as SteamWorld Heist, Mutant Mudds Super Challenge, and Terraria.